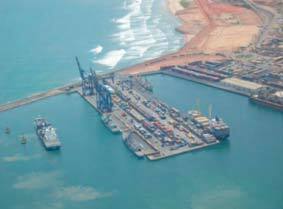 The Port of Tema is the largest and easily the most important of Ghana's 2 seaports. It serves the import and export needs of the whole country and specifically Accra, the capital. Recent estimates indicate that Tema handled over 80% of import/export traffic, the remainder being handled by Takoradi. Tema additionally serves the neighbouring countries of Burkina Faso, Niger and Mali, all land-locked countries. Constructed in the early 1960s, Tema Port offers a dedicated container terminal with 3 new gantry cranes (making a total of five) and a number of RTG's plus a further 8 deep sea berths to cater for non-containerised cargo. Specialist facilities include a dry dock, a reefer berth adjacent to cold storage facilities, a crude oil discharge terminal, a dedicated berth for discharge of clinker and cement for the cement factory, a large fishing port for local and deep seas boats, liquid bulk discharge points and an offshore SBM for crude discharge outside the main port. Operated by Ghana ports and Harbours Authority, with a concession allocated to Meridian Port Services (MPS) the operators of the container terminal, Tema is well regarded as an efficient and capable port within the region and recent investment has been made in deepening of the berths, establishment of bonded facilities, truck parks, off-dock depots etc to decongest the port itself. The port of Takoradi, Ghana’s premiere port was opened in 1928. Takoradi, the Regional capital of the Western Region of Ghana is situated between the Ports of Tema and Abidjan. The Port is well connected to its hinterland which makes it the ideal gateway to the middle and northern part of Ghana and to Burkina Faso, Niger and Mali. The Port is also serviced by leading shipping lines/companies and clearing and forwarding companies. Annually, the Port handles over 600 vessels and handles 40% of total national seaborne traffic, 60% of national exports and 20% of total national imports. The main exports include Manganese, Bauxite, Cocoa and Forest products while key imports are Clinker (for cement fabrication), containerized cargo, Oil products and wheat. In recent years Takoradi has been handling large volumes of transit cargo for Burkina Faso, Mali and Niger. Many transit operators have found the Takoradi corridor fast and cost-effective and thus prefer to use this corridor. Ghana's burgeoning oil and gas exploration and production industry is centred in Takoradi and there is significant activity for OSV's at Takoradi and at Sekondi, the neighbouring Navy port which additionally hosts some oil and gas activity. Berthing facilities include four multipurpose berths with drafts between 9.0m to 10.0m and dedicated berths for Manganese, Bauxite and Oil. There are also buoys with a maximum draft of 11.0m. OSV's are additionally catered for at a dedicated berth which has liquid bulk (mud/cement/water) storage and transfer facilities. With the completion of its three modern sheds, the Port now has a covered area of 140,000 sq. metres and an open storage area of 250,000 sq. metres which enables the Port to store a variety of cargoes. The Port has a container holding capacity of more than 5000TEUs and 100 reefer points for storing refrigerated containers. There is currently on-going construction/expansion works within the port. The break water has been extended by 1080m and this will pave way for the construction of additional berths to cater to to break bulk and bulk shipments. Hull Blyth's services are varied and diverse but all share a common theme, that of value. Hull Blyth is a specialist ship agency serving the fast growing markets of Ghana, Nigeria and South Africa.